Wind and rain have cancelled ferry sailings so while waiting for the storm to abate I'm using the free wifi at the terminal to figure out mobile blogging with my I phone. Hmmm. It's wet out there. Hope your Saturday is more profitable than mine. Hope you get to where you are headed before too long. Yes you got it right and it worked! You are making good use of your waiting time, Lorrie. Hope the weather clears and it will be smooth sailing real soon. 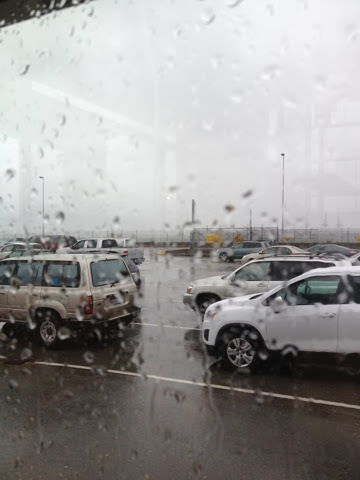 OH boy Lorrie... not a day to take a ferry ride. I hope the water settles down soon so you can get where you are going soon. Not a fun day I'm sure. Did you manage to figure out mobile blogging on your iPhone? Safe travels to you. Gracious, I hope you get home safely! Oh goodness Lorrie; I hope you'll be able to have a safe crossing soon! Take care!! Oh dear! and I see the ferry from Mayne island crashed into a dock not long ago -- it's stormy out there. Take care! It looks like you figured out how to blog by phone. I hope you don`t have to spend too long at the terminal and that you`ll be curled up at home soon. You learned something new and valuable! I hope that you are safely home by now. Well you seemed to have accomplished a post and photo! Hope you get some good weather soon! Well you did put the time to good use learning something new. Good job and glad you made it safely home. Our weather here in Ontario is the same, high winds and a lot of rain .. all weekend by the look of it. Hope your weather will get better soon. It is wet and stormy here too - hope the ferries are running soon. They closed the bridge across Lake Washington because of high waves blowing onto the roadway - quite a storm. I haven't learned that trick yet. Hope you made it without too long of a wait. Our 520 floating bridge was shut down due to wind for a while yesterday.